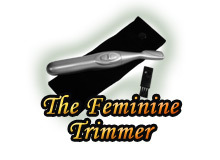 Just one more reason to purchase the Body Bare Pubic Shaver from Personal-Shavers.com. That's right, if at any time in the future the blade and/or foil becomes worn due to normal wear and tear, it will be replaced. Simply return the worn blade/foil combo with return postage and a new foil/blade set will be sent to you right away. No other Intimate Shaving System provider supports their product with lifetime blade and foil guarantee. Click below to view cart and check out. We've got some great package deals. Novelties and accesories not included on this page. Get ALL 3 great shaving products for only $89.99 !! 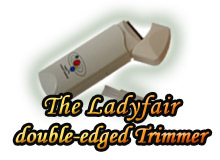 The personal Body Bare® shaver, Ladyfair and Feminine a great Triple Combo offer! The Silk & Satin package comes with all of the necessary items to keep your body silky soft and like satin to the touch. This is a perfect gift for anyone who wants to keep their personal areas perfectly manicured 24/7. The Body Bare Shaver includes wall adapter for the recharger, travel case, protective cap & cleaning brush & your choice of rechargeable or battery operated. Shaver Maintenance Kit which includes baby powder (corn starched based), Professional Upstage Retractable Application Powder Brush (great for traveling), 1 vile of lubricating oil (with eye dropper) that will last years and keep your shaver in tip top shape. 1 replacement blade and foil in case of accidental damage. Pay only $129.92 and save $40!!! The Beach Bum package is meant for those who want or need to stay smooth all the time without ever having to deal with stubble. Be at the beach every single day with the smoothest bikini line ever. Shaver Maintenance Kit which includes baby powder (corn starched based), Professional Upstage Retractable Application Powder Brush (great for traveling), 1 vile of lubricating oil (with eye dropper) that will last a year and keep your shaver in tip top shape. For Accessories, please visit the page for purchasing.